When you break down the ingredients in your average breakfast burrito, potatoes are pretty common – especially for vegetarians. 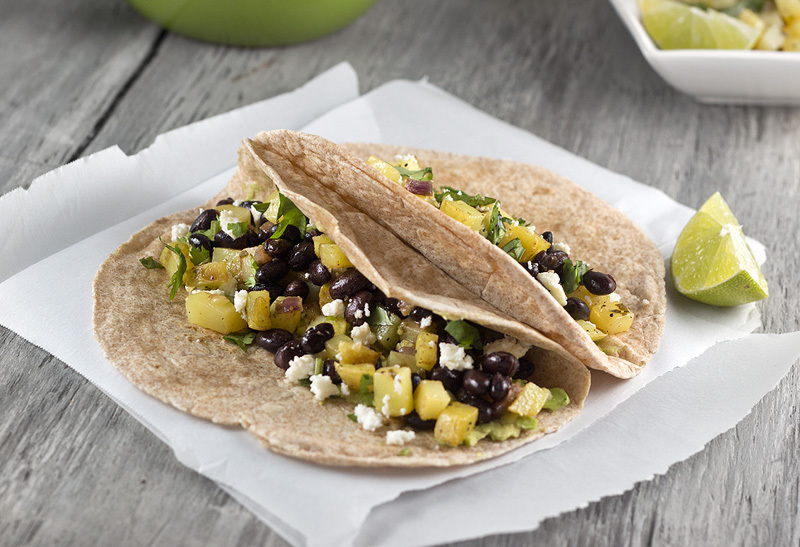 While they are delicious in the morning, adding potatoes to your filling options on taco night is just as good. These potatoes roast unattended while you dance around in your living room or top your previous record time for bathing a cat. By the time you’re done cleaning your wounds and applying bandages you just need to give them a quick stir and then go spend another few minutes practicing on the oboe. 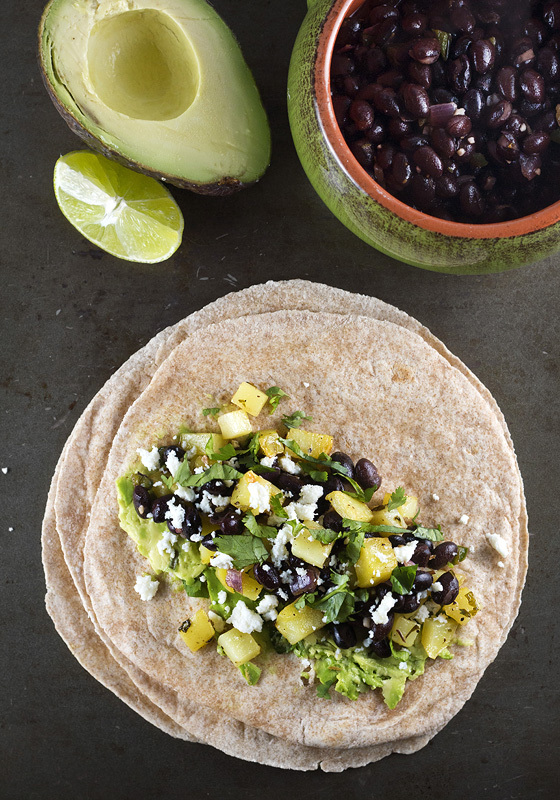 It’s really quite simple to make, and you have a complete, no fuss dinner when you stuff them into a couple of warm tortillas with canned black beans, fresh avocado, and (if you eat dairy) some crumbled queso fresco. Whenever I buy canned black beans I like to tweak the seasoning to suit my tastes. It almost always involves a bit of oregano, ground cumin, garlic, and chili powder. I will also stir in a tablespoon of tomato paste for an extra punch of flavor. If you want your beans to have a sort of slow cooked, smoky, “meaty” flavor – bacon salt is an awesome (vegetarian friendly) way to accomplish this. I love adding a touch of bacon salt to my bean recipes; it’s not enough to taste bacony but it provides a really nice savory undertone. 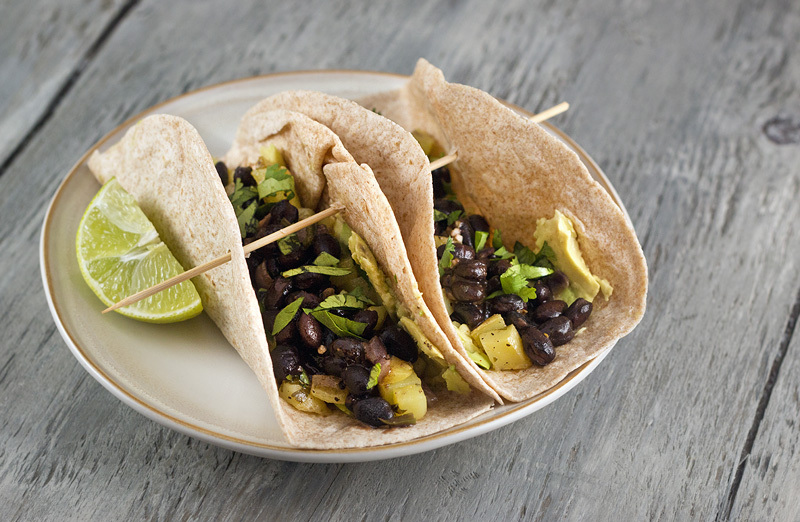 This is a smaller yield recipe that is ideal for 3-4 people (depending on the other ingredients going into your tacos) but it is easily doubled to accommodate more. Cilantro haters need not fear – this would work nicely with whatever herbs you enjoy. Lemon and parsley would be a bright, fresh flavor for a weeknight side dish if you don’t feel like getting all Southwesterny. And of course you can always eat them for breakfast! 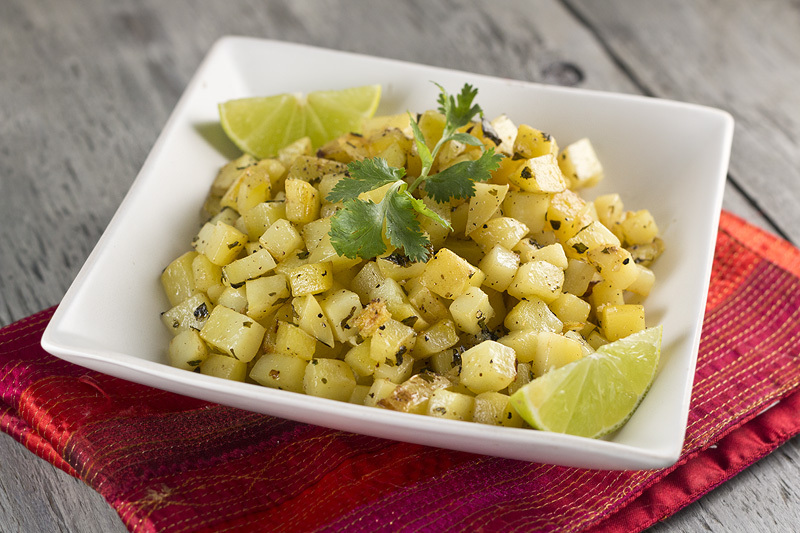 Tender potatoes roasted in a dressing of fresh cilantro and lime. Whisk together 1 1/2 tablespoons of olive oil, lime juice, pepper, cilantro, and sugar. Set aside. On a cutting board, sprinkle salt over minced garlic and scrape it down with the flat side of a broad knife. Continue crushing the garlic with the salt to make a paste. Whisk garlic paste together with the teaspoon of olive oil and toss with your diced potatoes. Arrange potatoes on a parchment lined cookie sheet and transfer to the oven for 10 minutes. Toss potatoes with the prepared dressing and transfer to the oven for another 8-10 minutes. 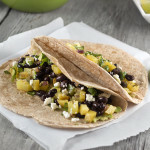 Serve with warm corn or flour tortillas, black beans, fresh avocado, and queso fresco. I have conflicting emotions whenever I go into a restaurant and see they have a veggie burger on the menu. On one hand I get excited – hoping for a hearty, flavorful patty made in-house by someone that understands not all vegetarians are out to eat fat-free, gluten-free, low-sodium rabbit food. I mean I’m going there for a burger after all. On the other hand I get an overwhelming feeling of cynicism, as I know I’m much more likely to be presented with one of those mass-produced hockey pucks from the freezer aisle of the local grocery store. Then on another hand (I can have three hands; don’t judge me) I’m just thankful there is a vegetarian option at all. One thing I can always count on though is a super delicious veggie burger made in my own kitchen. For me, a well-crafted veggie burger needs to hit on three major points: pronounced flavor, contrasting textures, and the ability to make me lean back and pat my belly in sated bliss upon consumption. Having the recipe be quick and easy certainly doesn’t hurt either. 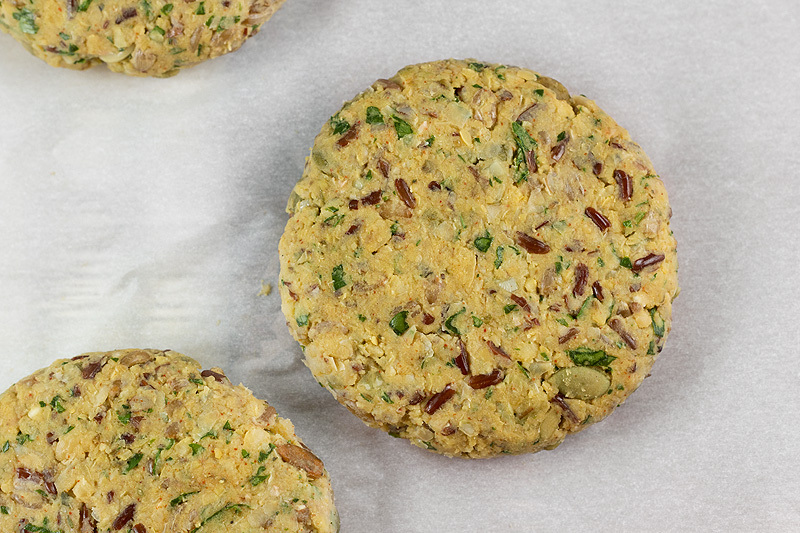 This vegan patty whips up in the food processor in just a minute or two, but then it meets all of my requirements for an excellent burger as well. When paired with the olive and tomato relish, a smear of bright lemon basil pesto, and warm feta cheese (or not if you’re vegan) it all comes together into a savory, complex combination of flavors that truly satisfies a rumbling tummy. 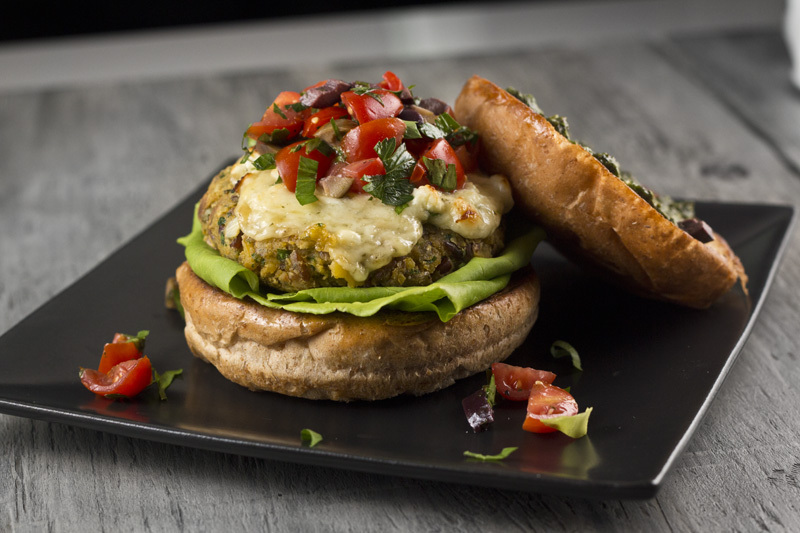 There are two key factors that contribute to the texture of these burgers. Obviously one of them is going to be the ingredients. I blend farro into the mix for a nice bit of chew throughout, and at the last minute I also add in roasted, salted pumpkin seeds for just a little bit of crunch. The second factor is properly combining the ingredients. Don’t go crazy and pulverize your ingredients into an nondescript, beige paste. 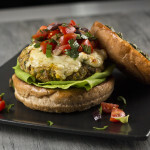 Small pieces of chickpea, bits of chewy grain, and whole seeds will give your burger a much nicer bite. When your patties are formed you should be able to identify most of the recipe’s components. If it looks like a chunk of slice-and-bake sugar cookie dough you’ve definitely gone too far. 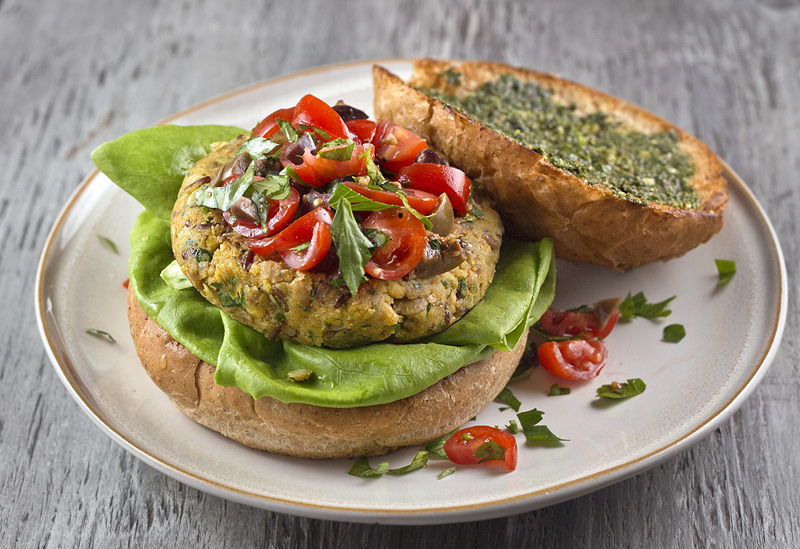 Quick to make and packed with flavor, these vegan burgers make a great weeknight meal. Place everything except for the pumpkin seeds into the food processor and pulse until combined, but still chunky. Add pumpkin seeds and pulse a little bit more. I personally prefer most of the seeds to remain intact, so one or two quick blitzes does the trick for me. Divide mixture into four equal pieces and shape into patties. If desired you can cover and transfer to the refrigerator to cook later. Heat a small amount of olive oil or cooking spray in a nonstick skillet and sear your patties on each side. Serve on toasted bun with tomato olive topping (recipe below), pesto spread, greens, and if you’re not vegan, melted cheese (I used a blend of havarti and feta). 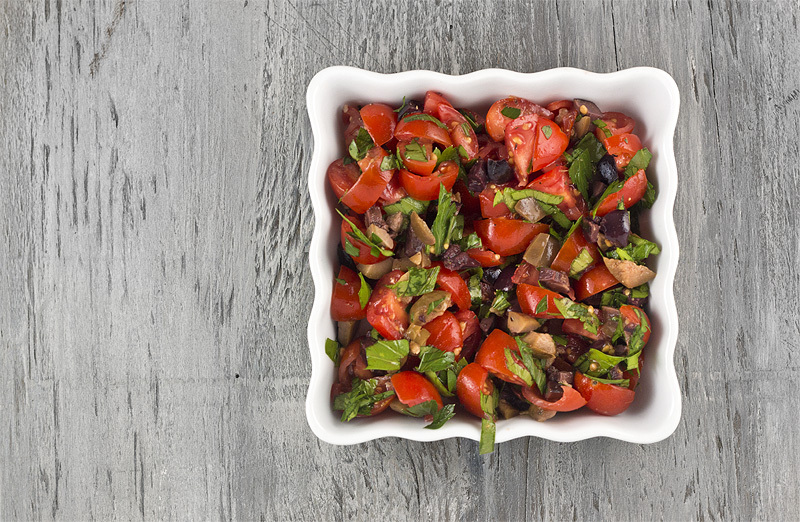 The combination of sweet tomatoes and salty olives is a perfect addition to the smoky flavors in the burger. Serve on top of your burger. The first time I tried gnocchi was from a vacuum-sealed pack I picked up at my local grocery store. At first bite I immediately wondered how I had gone so long without even once consuming these tasty little dumplings. Seriously, what was I doing with my life? You can imagine how I felt the first time I ordered a plate of fresh, handmade gnocchi from a reputable Italian restaurant. I was floored by how much more light and pillowy they were than their prepackaged cousins. With that meal I decided that I needed to learn how to make gnocchi myself… which unfortunately led to a series of failures that never measured up to the quality I came to expect from an Italian kitchen. Through trial and error, plenty of research, and a bit of patience, I’m happy to say that I’ve finally married each of the elements needed to making a soft, delicious gnocchi! 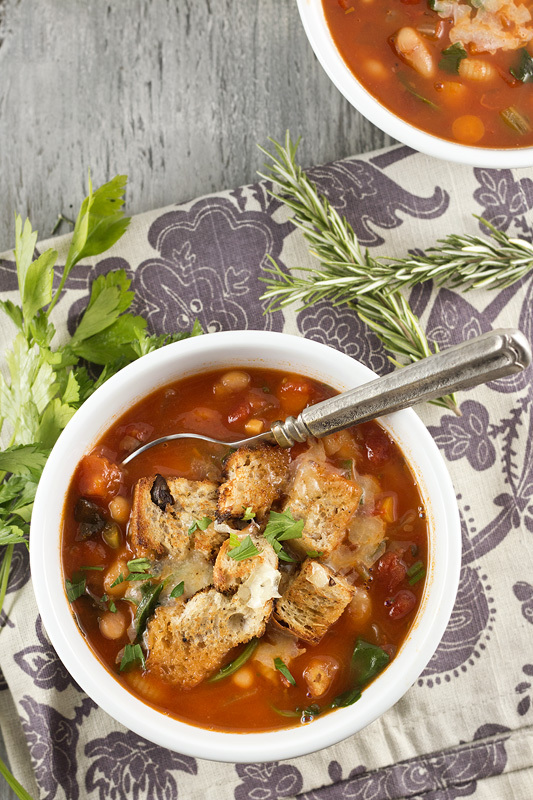 Making a dish like this is certainly a labor of love, but the results are very much worth it. Even though the entire process is rather lengthy, the majority of that process is waiting. Handling the dough is arguably the most tedious step, particularly if you choose to roll your gnocchi on a gnocchi board or a fork to get the iconic grooves in each dumpling. The nice thing is that you don’t have to roll your gnocchi. It’s perfectly fine to simply cut up the pieces and cook them as is. There is a benefit to the grooves however – they provide a lot of “grip” for holding onto sauces. If you want a compromise you could simply press a small indentation into each dumpling and forgo the grooves. Choose the right potato. You want a mealy, starchy potato (such as a russet). Make sure your potato flesh is dry and lump-free. I use a ricer to get an even, fluffy texture. Use only enough flour to bring the dough together. Do not over handle the dough. This runs the risk of producing dense, heavy gnocchi. Cook your gnocchi at a gentle boil, not a rapid one that will throw them around in the pot. They cook quickly, be ready to scoop them out as soon as they float to the surface. I started by boiling 3 medium sized russet potatoes in well-salted water. Once fork tender (about 30 minutes) I took them out and removed the skins with the help of some paper towels. The potatoes were still warm and the paper towels not only have an uneven texture that pulls the skins away easily, it also makes it possible to handle the hot potatoes. The naked tators were pressed through a ricer onto a cookie sheet lined with paper towels. This is a step that I made up myself after having experienced problems with too-wet potatoes in the past. I preheated the oven to 200F, put the cookie sheet in the oven, left the door cracked open, and turned off the heat. The potatoes were left there to cool completely and the residual warmth from the oven helped dry them out a little further. Once cool, the riced potatoes were put onto a lightly floured surface and sprinkled with about 3/4 cup of cake flour. One recipe I read suggested 1 cup of flour per pound of riced potatoes – 3/4 cup ended up being the right amount for me. I used cake flour because of its lower protein content, which during my intense gnocchi studies I learned helps promote a lighter texture in the end. Work the flour into the potato until it become a soft, pliable dough. Cut dough into 3-4 equal pieces and roll the pieces into ropes. 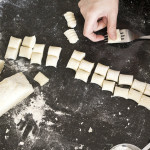 Line the ropes up next to one another and cut your gnocchi into approximately 1″ pieces. You can either cook them this way or choose to roll your gnocchi on the back of a fork (or gnocchi board) to get the grooved texture. Place the gnocchi at the top of the fork tines and gently press down, rolling it across the fork with your thumb. It will be slightly curled with the indentations on the opposite side. That’s all there is to it! Yeah ok, I know it is kind of a lot of take in. The only way to really master the technique is to buy some potatoes, flour up your hands, and get to practicing! The beautiful thing about gnocchi is that once you’re done making them, they cook in a flash, and there are dozens of super quick ways to serve them. 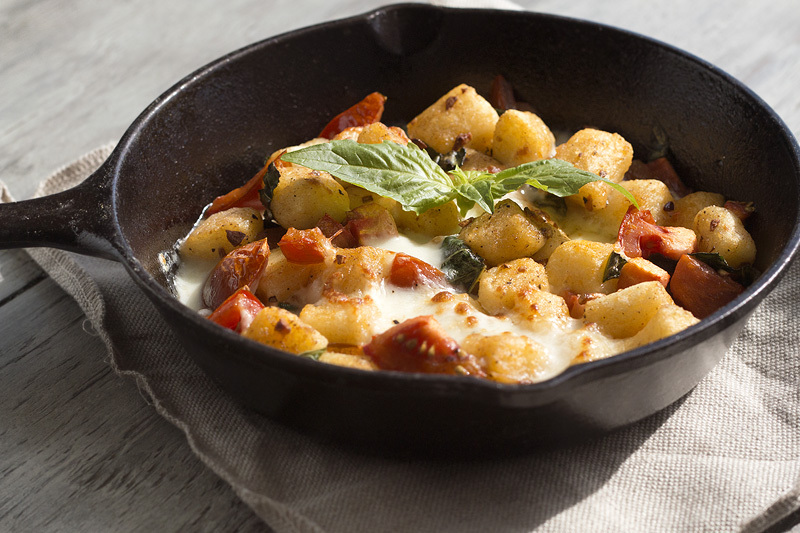 Gnocchi have a very simple flavor on their own, making them ideal vehicles for rich, flavorful sauces. I prepared (and photographed) my finished gnocchi three different ways to give you some ideas for serving. Each of these preparations took under 10 minutes. The top image on the page is the vegan option where I sauteed garlic in a bit of olive oil and threw in the gnocchi (straight from the pot it was boiling in) with some pine nuts. Just before serving I squeezed lemon juice over the top and tossed it with fresh parsley and black pepper. 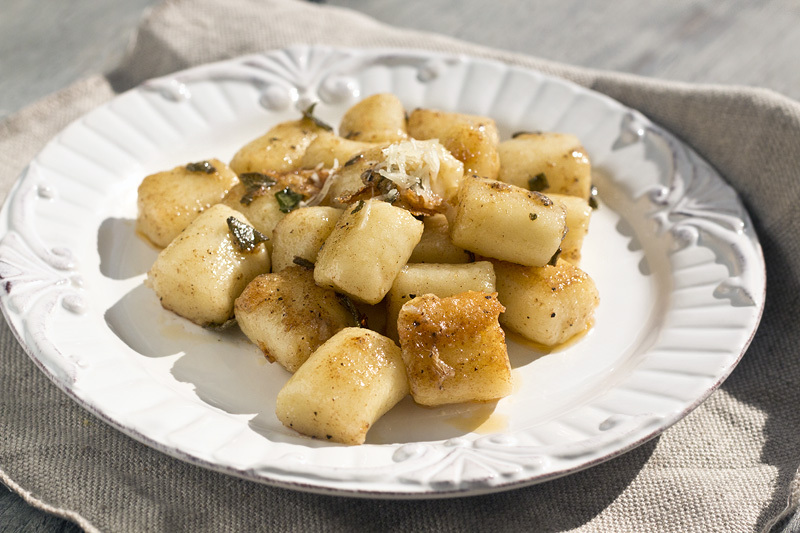 The second dish shows one of the more common ways of serving gnocchi. Browned butter with sage. It’s hard to beat a classic! The final image (at the bottom) shows an oven-baked variation. I sauteed some garlic in a bit of butter, threw in my cooked gnocchi to get a quick sear, added chopped tomato, torn basil, and cubes of soft, fresh mozzarella. Popped it under the broiler for a few minutes to brown the top and it’s done. 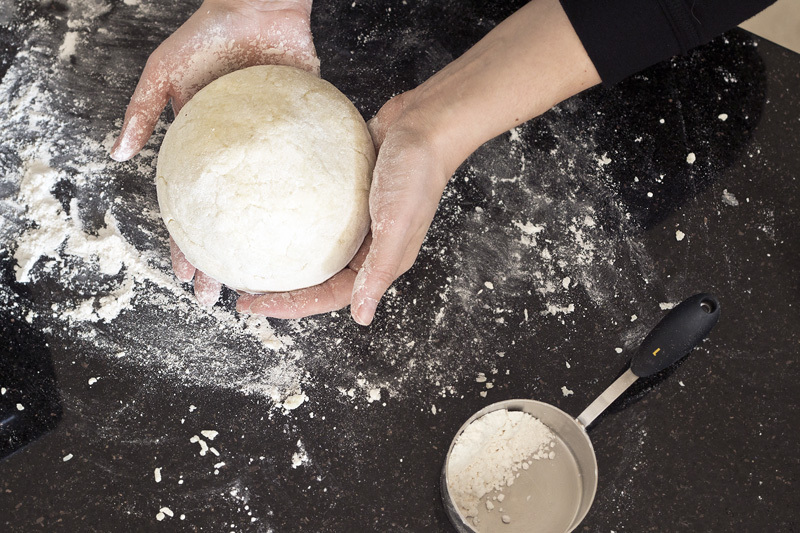 Now all you need is some fresh handmade gnocchi and you’re good to experiment on your own! A soft, fluffy gnocchi prepared without any eggs. In generously salted water, boil potatoes until fork tender (about 30 minutes for the potatoes I used). Remove potatoes from boiling water and carefully remove the skins. Press potatoes through ricer. If you do not have a ricer I’ve heard that grating the potatoes works quite well too. Transfer potato to cookie sheet lined with paper towels and place in oven. Turn off heat, crack open the oven door, and allow potatoes to cool completely. Put fresh pot of salted water on to boil while you make your gnocchi. Spread cooled potato mixture onto lightly floured surface. Sprinkle with a bit of salt (maybe 1/4 teaspoon) and cake flour. Work flour into the potato until it becomes a smooth, pliable dough. Cut dough into 3-4 equal pieces and roll into ropes. 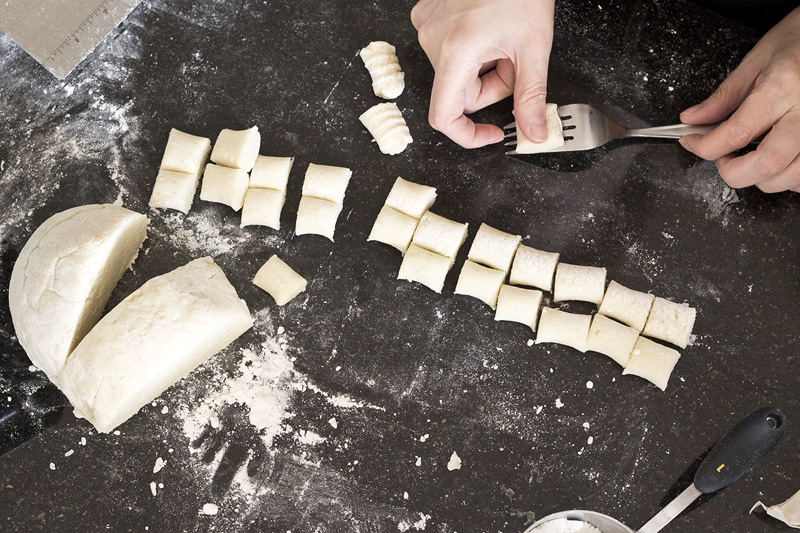 Line ropes up side-by-side and cut your gnocchi into roughly 1″ pieces. If desired roll your gnocchi on the back of a fork for added texture. 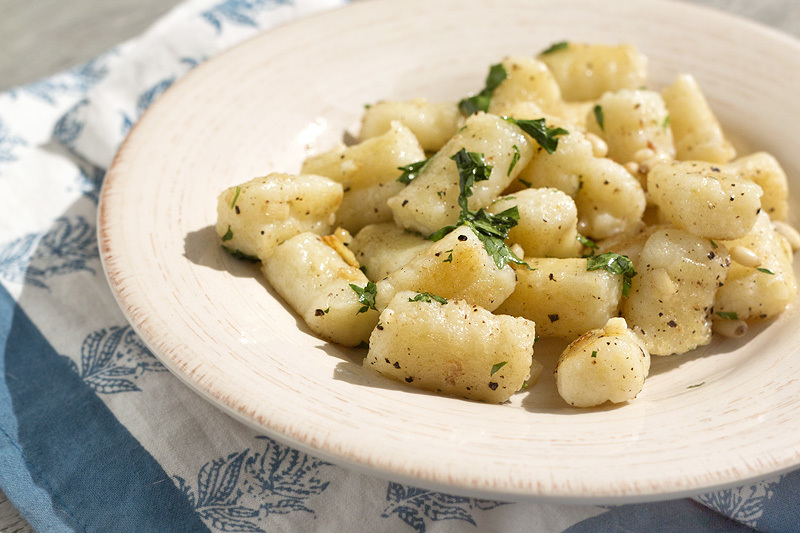 Put cut gnocchi into gently boiling water (if the boil is too rough it can bounce them around more than necessary). When they float to the surface they are cooked. Remove immediately from water and toss in hot oil, butter, or other prepared sauce of choice. I think quite a few people are intrigued by the vegetarian lifestyle. A really common question that arises when people learn I don’t eat meat is, “Well what DO you eat?” There is a misconception that vegetarians survive on microgreens, tofu, and a cocktail of multivitamins… but in my experience this is rarely the case. Since becoming a vegetarian I still enjoy almost all of the dishes I loved when I ate meat – chili, tacos, stew, biscuits & gravy, pot pie – I just prepare them a little differently now. There are also a remarkable number of everyday entrees that are veggie-friendly without any ingredient changes – macaroni and cheese for instance. 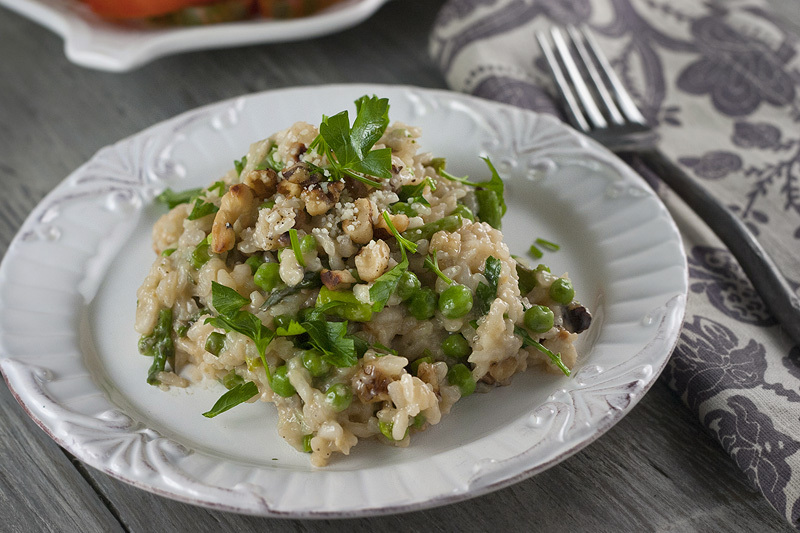 Or in this case… risotto! 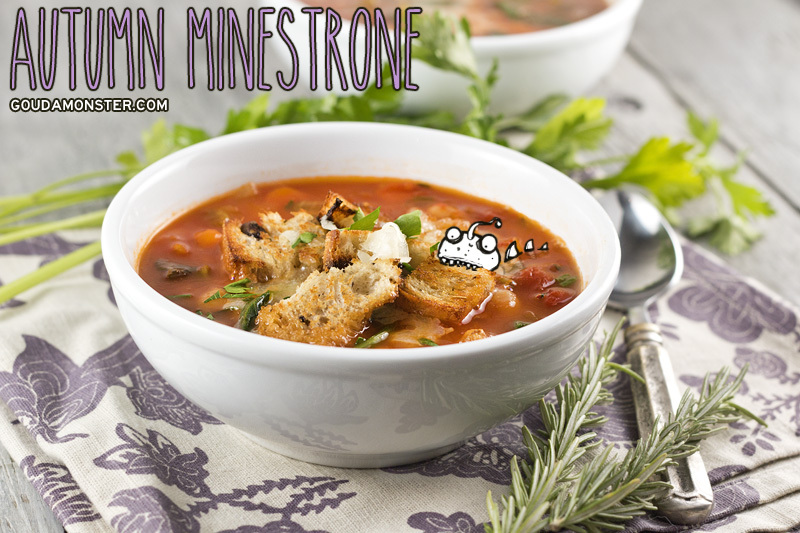 Not quite so easy to find in restaurants due to the fact that it’s usually simmered with a meat-based stock, but that is a great example of one of the minor adjustments you can make in a recipe that doesn’t affect the quality of the finished dish. You could even take it a step further and easily make it vegan by omitting the Parmesan and cooking with olive oil instead of butter. It will still be creamy and flavorful and awesome. Many people dread the idea of cooking risotto from scratch because it requires a certain level of dedication. Sure it’s not a simple crock pot recipe that you can toss together and ignore for an hour, but I think the effort of risotto cooking is a little blown out of proportion. If you make risotto you’re going to be actively cooking for most of the process – but don’t let that deter you from giving it a try. The focus needed is minimal (whirling a spoon around while watching the TV in the other room) and the outcome is so worth it. 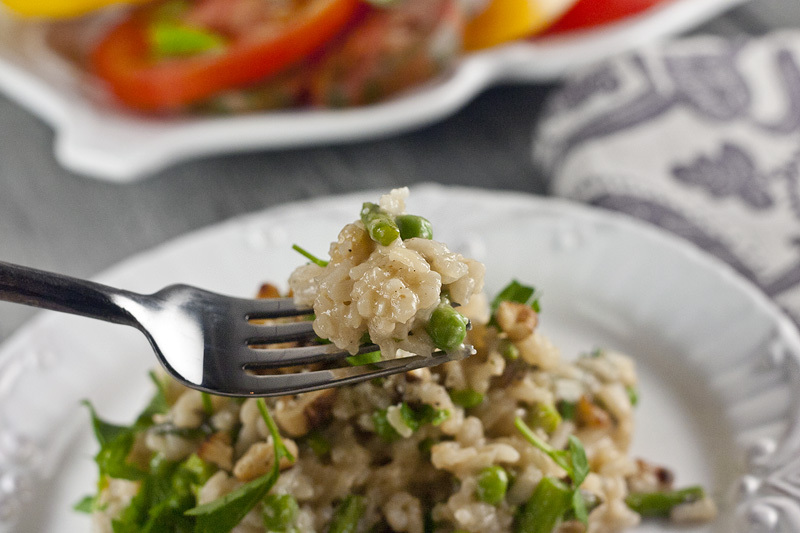 Risotto is one of the ultimate comfort foods and it can be as rustic or as elegant as you like. Maybe you prefer a soupier consistency or maybe you want a pile of rich, starchy goodness that you can mound up on a fork. There is a lot of room for play once you have the basic technique down. Just make sure that before you start you have your stock warmed up and nearby so you can easily ladle it into the rice. I use the two front burners on my stove – one for the stock and the other for the risotto. Ready to try it? Of course you are! 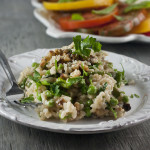 Creamy, comforting risotto – it’s not as hard as you think! Melt 1 tablespoon of butter in a high sided skillet and cook onions and garlic until warm and fragrant. 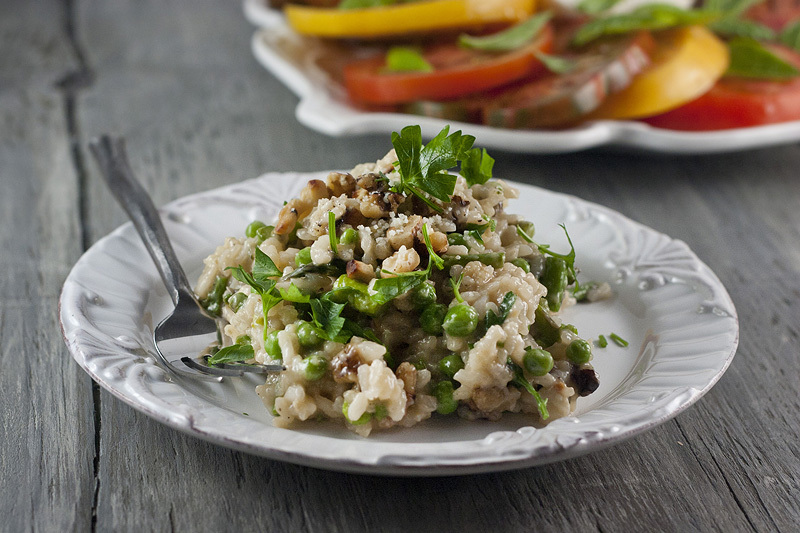 Stir in arborio rice and allow to cook for a couple minutes to absorb the flavors in the pan. Pour white wine over the rice, stir well, and cook until liquid is absorbed. Add 1/4 cup of your vegetable stock and cook until absorbed, giving it a good stir every now and then. Whenever the liquid has almost absorbed (don’t let it get dry) into the rice it is time to add another 1/4 cup of stock. You will repeat this process until the rice is al dente. While the risotto simmers away you can cook up your asparagus. Melt about a teaspoon of butter in a nonstick pan, toss your chopped asparagus with it, and cook 8-10 minutes. It should still be bright green with a little bit of bite to it. Turn the heat off. Stir frozen green peas into the asparagus and cover. The residual warmth of the asparagus will thaw and cook the green peas while the chill from the green peas will keep the asparagus from continuing to cook in the pan. It works out great. When the rice is done (taste it to be sure, it took about 20-25 minutes for me) stir in the additional tablespoon of butter, parmesan cheese, cooked veggies, parsley, walnuts, and any additional seasoning. 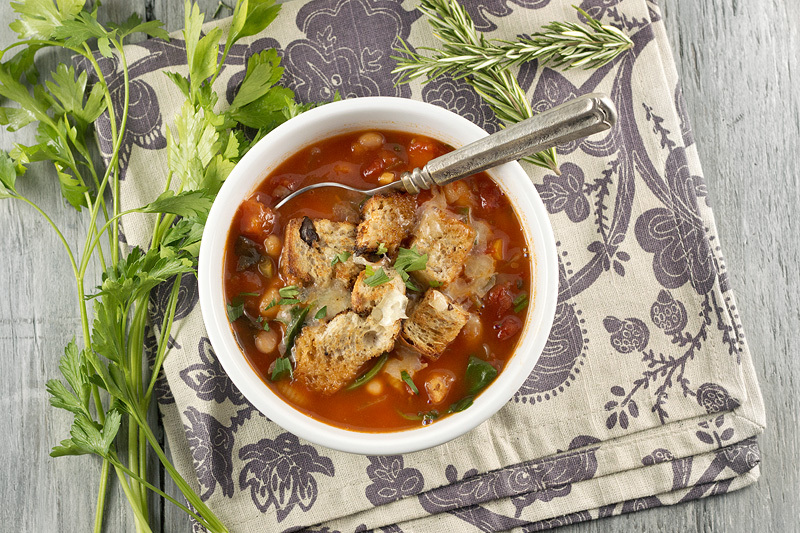 You may find you don’t need to add salt if the sodium content of your stock is high. Even though I’m a mega cheese beast, I do occasionally make a vegan entree. 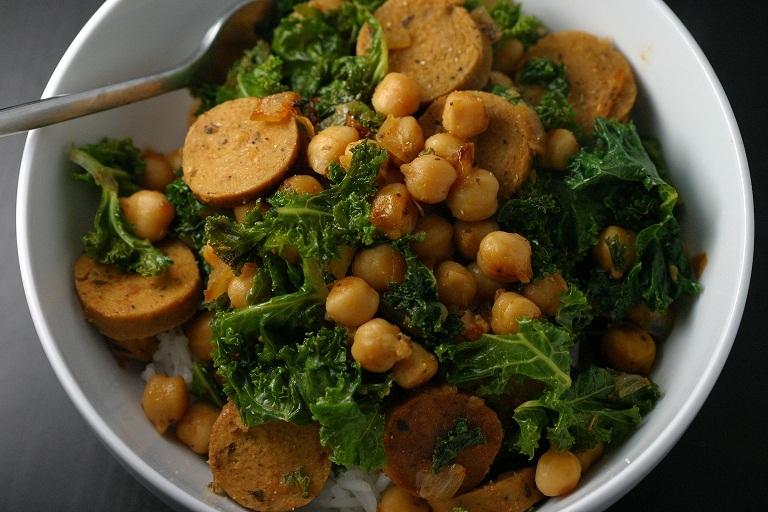 This is a really hearty dish with lots of protein, and the kale provides lots of vitamins as well. I’ve used Tofurky brand sausage links, but use whatever brand you like – or if you’re not a vegetarian try using turkey sausage or something of that sort. One half of the entire dish as I’ve listed it below (which is a lot of food) comes in under 500 calories and has a nice 38g of protein. I really love making this because it comes together in one skillet in a very short period of time. Prep and clean up is incredibly easy with this one! 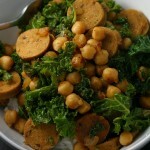 A vegan meal chock full of protein and nutrient dense kale. Cook the onions and garlic in the olive oil until slightly translucent. Add the chickpeas, dried seasonings, and a couple of tablespoons of water. Cook until the chickpeas are warmed through and starting to caramelize around the edges. Stir in the sliced sausage and continue to cook until warmed through. Put in your chopped kale, a couple more tablespoons of water, and cover to allow the kale to wilt. Once it’s wilted, but still nice and green, salt and pepper to taste.